Dr. Zheng completed his B.S in Hangzhou University in Hangzhou, China and his Ph.D at State University of New York. Dr. Zheng holds the Joey and Toby Tanenbaum/Brazilian Ball Chair in prostate cancer research. 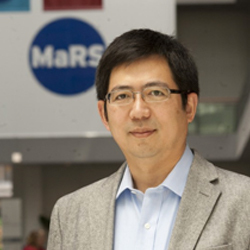 Dr. Zheng”s research focus involves the creation of a unique organic nanoparticle delivery platform capable of transporting cancer therapeutics directly to tumours. This research earned Dr. Zheng UHN’s 2010 Inventor of the Year Award. This award is presented to a UHN researcher who has made an outstanding and inventive contribution to patient-oriented biomedical research. Dr. Zheng also recently developed a new class of nanoparticles, called porphysomes, which convert light to heat in an energy efficient manner. When accumulated in tumours, porphysomes converted light from a laser and successfully destroyed the tumours through photoablation. His work has appeared in over 100 publications, including prestigious journals like Nature Materials and the Proceedings of the National Academy of Sciences.